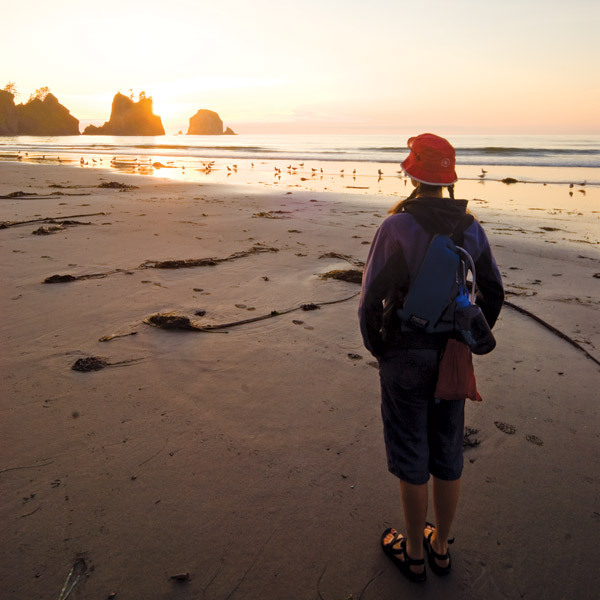 Though they’re rarely hot and sunny, Washington’s coastal beaches really bring the drama: wild, ever-changing weather, vast stretches of windswept, solitary beaches and fantastic, eerie sea stacks. Sure, shivering in layered fleece isn’t the typical beach dream, but spend a day strolling the rugged, rocky shores, listening to the thunderous surf and watching tattered seagulls straining into the wind, and we’re betting you’ll leave refreshed and invigorated (and with some pretty fierce hair). Want to get the full beach experience? Managing editor Kristen Russell has your beach bucket list right here. Don’t let the bear warnings deter you: Backpacking to one of our Olympic National Park beaches is serious fun (and the bears don’t want to meet you). It’s an easy two-mile stroll along boardwalk and sand to get to Shi Shi Beach near Neah Bay (good thing—that pack’s getting heavy!). Sure, there could be 200 other campers joining you on a summer weekend (and you’ll need a permit; nps.gov), but train your gaze on that churning surf, fire up that camp stove and settle back in the sand for the quintessential Northwest experience—falling asleep under the stars with the hypnotic sound of pounding waves—and a night you’ll never forget. Surf’s up! Our state ranks third in the most miles of coastline in the U.S., so it shouldn’t surprise you (though it may) that there are great places to surf in our state. One of Washington’s premier surf towns, Westport, boasts three sandy, surfy beaches that are just a two-hour drive from Seattle. Westhaven State Park is a great spot for beginners to catch their first waves—swells range from 3 to 6 feet, summer through early fall. (For lessons, see directory.) Seeking a sicker ride? Scrunch into that wetsuit and check out nearby Half Moon Bay, where the swell is shallow and breaks closer to the shore. Every May, Westport hosts the largest surf competition in the Pacific Northwest, the Clean Water Classic (cleanwaterclassic.com).